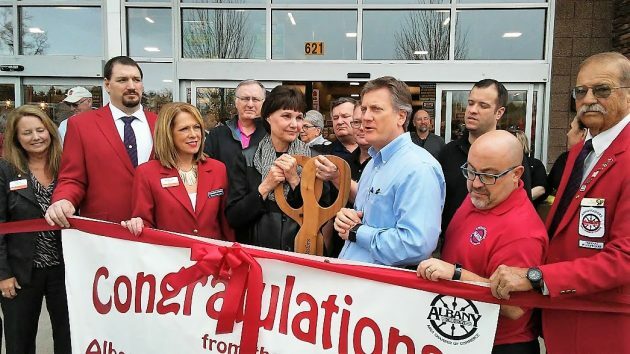 Surrounded by Chamber of Commerce ambassadors, Mayor Sharon Konopa and Tyler Myers, in the blue shirt, get ready to open the new North Albany Supermarket Tuesday. North Albany’s long wait for a supermarket is over. 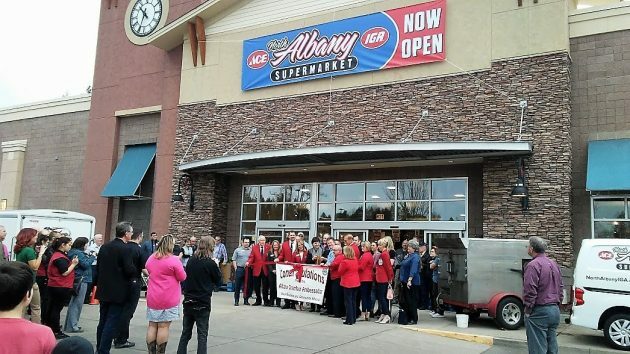 Now customers can demonstrate that opening the North Albany IGA Supermarket and Hero ACE hardware store was the right move. The store opens for shopping at 6 Wednesday morning. It will be open from 6 a.m. to 10 p.m. seven days a week. About 200 people got a preview Tuesday afternoon, wandering around the aisles, meeting some of the staff, and sampling all kinds of appetizers. Mayor Sharon Konopa cut the obligatory ribbon along with Tyler Myers, president of The Myers Group. That’s the company, based in Clinton, Wash., that is running the store, one of a chain of groceries and other businesses around the Northwest. The store building in the North Albany Village shopping center had been empty since Ray’s Food Store left some five years ago. The former downtown Albany liquor store, whose state license was transferred to The Myers Group last year, has moved into what had been a community meeting room in the back of the supermarket. In the front, a restaurant-like seating area near the deli and coffee counter has been equipped with more tables. The company intends to build an outdoor greenhouse on the store’s west side, where the hardware section is. Myers told me that though it’s been described as a greenhouse, it’s really more like a building complete with fire sprinklers and a reinforced foundation. It has not been started because the company is still waiting for its city permits, which Myers expects to receive soon. A temporary sign hangs over the opening ceremony at the long-awaited North Albany market. Hooray! We have missed having a grocery store in this area. Now there’s food and booze available in N. Albany, the need for a top notch cannabis outlet in that part of town cries out. Imagine, if you dare…one can now get medical care, quasi-decent Chinese Take-Out, munchies at the grocery, a car wash and a bottle of Scotch. The one thing holding North Albany back from taking it’s rightful place, is the lack of recreational pot outlets. Ideally, residents should be able to alter their consciousness without having to cross the bridge or make the harrowing Highway 20 ride to Corvallis. Wishing them better fortunes than Ray’s. The grocery business is so very competitive. Even though they are in N.A., they must still be price competitive with Fred Meyer’s and Winco, or folks will not support them with their dollars. Something about the nasty impatience of North Albany residents as they raved about their lack of grocery/liquor options grated on Mr. Hering. In the slashing flash of his pen, the Hasso Hering of old shone through. The Mayor looks enamored with Mr. Tyler in the photo. She’s a kind person and looks that way at everyone. Agreed, one of the nicest persons you will meet. I urge anyone that has an issue, go have a cup of coffee with her, she has far more patience than most of us. I checked them out yesterday during the soft open. It is quite a thing to be 10 steps between shopping for milk and chain saws. You can make a shopping trip to satisfy any mood! Started buying my milk in glass containers at the local NA IGA. It’s local Albany milk, they charge a $2.50 deposit on the bottle, but you get that back when you bring the bottle back. I’ve tried the chocolate milk, it’s really good, probably too good, but a great treat. CNNMoney had an article about the Chinese shutting off the taking in of recycled material. It’s only going to get more expensive if we don’t figure out something to do. First thing is figure out how to fix our sewer plant so we’re not having to dump everything into the landfills, that’s going to kill us. One more IGA bit, the new local, Coach’s salsa is the best I’ve had in a long time, almost as good as dad. I think IGA will have a hit, if they continue to focus on quality and local. thanks for the report steve. i will try their local milk for sure, and salsa.